Diwali is just around the corner and before the chance is lost for this year let me start this post with Shubho Bijoya greetings. Sorry for being so late but I always find it difficult to get back to the groove after the vacation, however mini it is, coming back from home is never easy. This year the vacation was extra special as we had the engagement ceremony of my younger bbrother just after the puja. We had to travel all the way from Santiniketan to Midnapore (Coastal Bengal) for the function. It was loads of fun with the family getting together on a festive note after a very long time. But the travel, numerous trips to the shops for the arrangements, the whimsical weather and the usual chasing after the kids made me really tired and lazy. And though am preparing all the usual Bijoya and Diwali sweets and snacks but not getting the enthusiasm to click and post them on the blog. This Chire bhaja is a family recipe which I tweaked a little to suit our personal preference is a hit among everyone.I even was asked to sell them in packaged form by a friend of my husband. My Kitchen is well stocked with this the year around. The family loves to have it with their evening tea and The husband always have a small dubba in his office for sudden hunger pangs. This also is a great item to serve to sudden guests. 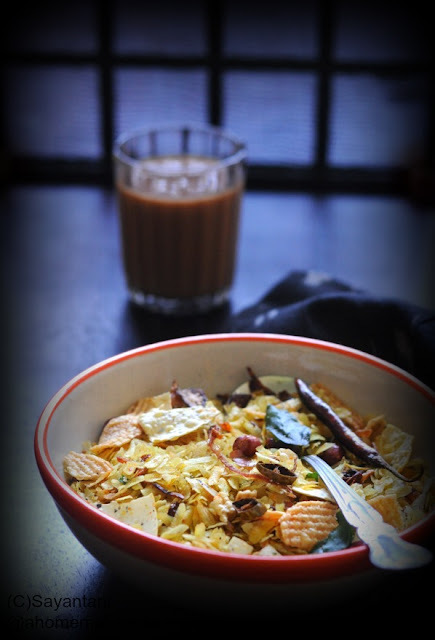 Unlike Chivda or bitten rice mix which is very famous in other parts of India our family recipe has crisp fried onions in it. So if you are planning to offer it as Prasad or Neivedya then please omit the onion. First comes the tedious process of dry roasting the Poha. Take a kadhai or a heavy bottom pan, preferably a medium size one to be able to stir the pohas properly. On medium flame start roasting it. Stir and spread them along the surface for even heating and cooking. It will take close to 8-10 minutes to make them crisp. Check by pressing if it cracks in crumble then it's ready. It should be crisp not chewy. Take out and let it cool. At this stage this is good enough to pair with sauteed vegetables or other add ons like Bombay mix, Alu bhujia etc etc. We often have a small jar of this at home during winter to pair with winter veggies. Peel and chop the onion as finely as you can. With your fingers separate them. Heat 2 tbsp oil and and add the onion slices along with a pinch of salt. Keep the heat on medium and cook till they are golden brown. Take out with a slotted spoon and keep aside. In the same oil fry the chips and take out. I microwaved the Papads, each side 30 seconds and later broke them in small pieces. Add the peanuts in the same oil and fry on medium till they are crisp and red in colour. Take out. I always dry roast the peanuts after my monthly grocery, this way it stays good for long and needs less oil while frying. Fry the curry leaves and take out. In the same pan add the rest of the oil and heat. Add the cumin, coriander, thinly sliced green chillies, thinly sliced red chillies, and few more curry leaves. 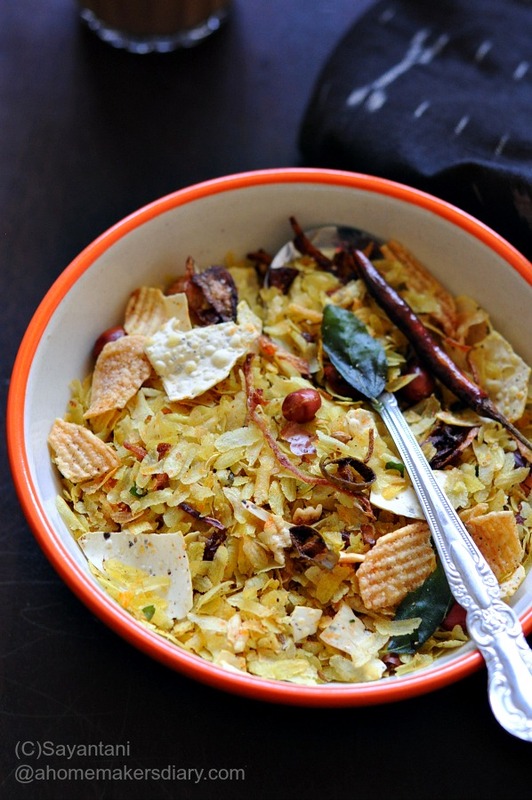 once they are golden sprinkle the turmeric, mix and add the crisped up and cooled poha. Keep the heat on low and stir to mix evenly. add everything that you kept aside earlier and mix. Sprinkle the salt, sugar, jaljeera masala and mix everything together. Taste and add more seasoning if needed. 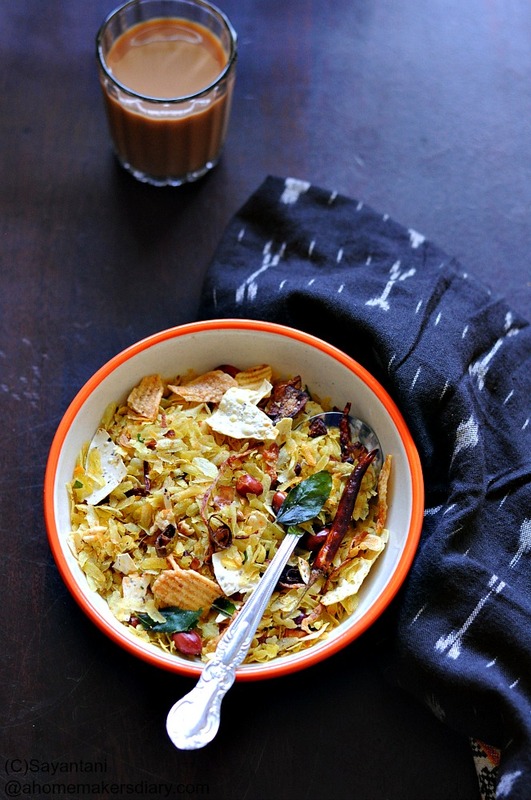 cook for 3-4 minutes till the flavours are mingled together and the poha is well coated with spices and oil. The taste should be a balanced one not too salty, sweet or hot. Once you are satisfied take it out on a flat surface or tray. Cool down and pack in air tight containers. Stays well for more than two weeks, well if that lasts that long. In Bengal we get two varieties one is the thicker one often referred to as Dhenki chanta or milled in a hand pounding device and the other machine made which is very thin like paper. I always use the thinner one for this as roasting them is easier and quicker. For chirer polao I prefer using the thicker variety which keeps it's shape intact even after washing them in several changes of water. The add ons for this recipe are endless. 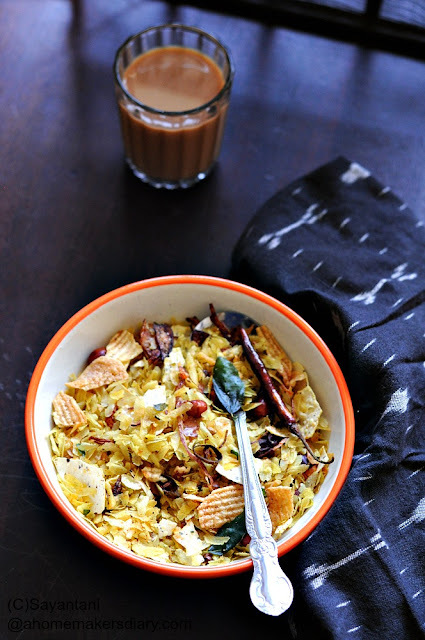 You can add chanachur, Sev, Fried cashews, raisins etc etc. We prefer to sprinkle chanachur or alu bhujia on top while serving. In winter We often pair this with lightly sauteed winter veggies like cauliflower, new potatoes, peas etc. But that should have a post of it's own. Homemade trail mix is just too tempting.. Great pics too..